I love the flavors of this easy chicken dish. It has a bit of sweet, a bit of savory, just the thing when you are craving take out orange chicken, but want a home cooked meal. And the fact that it is gluten and dairy free? Total bonus! Put all ingredients into a gallon sized freezer bag. Mix all ingredients together. Remove as much air as possible, seal, label and freeze. To serve: Thaw. Put all ingredients into an oiled baking pan. Bake at 350 degrees for 25 to 30 minutes until chicken is cooked through, basting a few times with the marinade. If you would like to serve this right away, simply let the chicken marinate for a couple of hours before baking as directed. 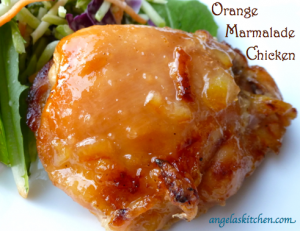 The best orange sauce I've ever made!